Latest data released by the Islamic Republic of Iran Customs Administration show Iran’s exports totaled 2.26 million tons worth $1.1 billion during the 11 months, indicating a 7.56% and 5.69% increase in tonnage and value respectively year-on-year. Imports stood at 2.13 million tons worth $1.24 billion, up 45.1% and 69.7% in tonnage and value respectively YOY. Located between Europe and Asia, the Caspian Sea, the world's largest lake, is bounded by Kazakhstan to the northeast, Russia to the northwest, Azerbaijan to the west, Iran to the south and Turkmenistan to the southeast, according to Financial Tribune. Iran mainly exported potatoes, liquefied natural gas, apples, kiwis, pistachios, tomatoes and dates to the Caspian states. In exchange, major commodities imported into Iran from the Caspian Sea countries included nuclear reactor parts, barley, field corn, sunflower oilseeds, radio navigation devices and sheep carcasses. In terms of total trade value, Russia topped the list among Caspian countries with bilateral trade standing at 2.23 million tons worth $1.38 billion, up by 37.28% and 57.57% in tonnage and value respectively YOY. Russia was Iran’s third export destination among Caspian states and 16th among all countries. Russia was the top exporter of goods to Iran among Caspian Sea states and eighth among all countries. Russia mainly exported nuclear reactor parts, field corn, barley and sunflower oilseed to Iran. Azerbaijan was Iran’s second biggest trading partner among Caspian countries during the 11 months, as two-way commercial exchanges stood at 803,100 tons worth $389.33 million to register a 27.61% and 29.66% growth in tonnage and value respectively YOY. Azerbaijan was Iran’s top export destination among these four states and 12th among all countries during the period. Iran imported 44,849 tons of commodities worth $18.63 million from Azerbaijan, down 24.23% and 16.35% in tonnage and value respectively YOY, a majority of which were non-alloy semi-finished iron/steel products, oilcake and chemicals. Azerbaijan was the third exporter of goods to Iran among the countries under review and 61st exporter to Iran among all countries. Turkmenistan was Iran’s third major trading partner among the states under review. Mutual trade between Iran and Turkmenistan amounted to 678,968 tons worth $374.38 million, indicating a20.92% and 6.06% decline in tonnage and value respectively YOY. Iran’s exports reached 664,179 tons worth $366.3 million, down 19.89% and 5.31% in tonnage and value respectively YOY, while Turkmenistan’s exports to Iran reached 14,789 tons worth $8.08 million, down by 49.95% and 30.87% in tonnage and value respectively YOY. Turkmenistan was Iran’s second export destination and the fourth exporter of goods to Iran among Caspian states. The country was Iran’s 13th export destination and 80th exporter to Iran among all countries during the period. Potatoes, sugar, apples, cast iron and iron/steel structures, pipes and livestock feed were Iran’s main goods exported to Turkmenistan, while Turkmenistan mostly exported petroleum coke, linter and mineral oils. 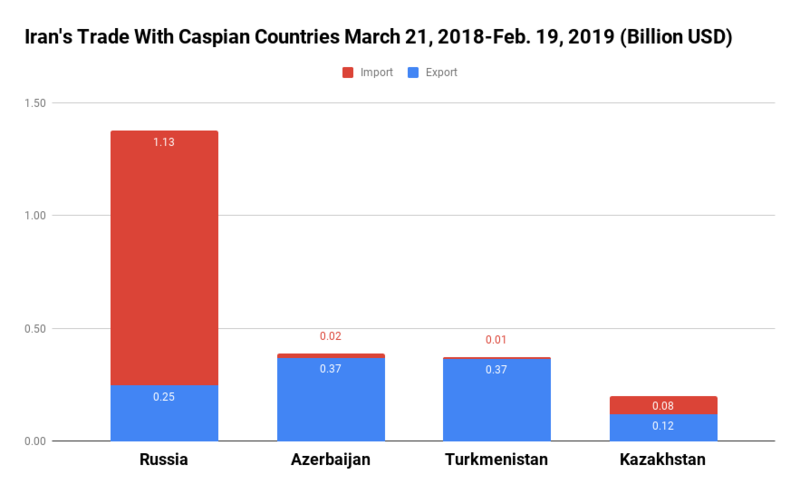 Kazakhstan was Iran’s fourth and last trading partner among the Caspian states during the 11 months, as two-way commercial exchanges stood at 683,461 tons worth $200.05 million to register a 47.99% rise in tonnage and a 0.15% decrease in value YOY. Iran exported 414,741 tons of goods worth $120.82 million to Kazakhstan, up 43.54% in tonnage and down 18.04% in value YOY. Kazakhstan was Iran’s fourth export destination among Caspian states and 29th among all countries during the period. Iran’s exports to Kazakhstan mainly included pistachios, dates and Portland cement. Iran imported 268,719 tons of commodities worth $79.23 million from Kazakhstan, up by 55.44% and 49.67% in tonnage and value respectively YOY, which mainly consisted of barley, sheep carcasses and colza seeds. Kazakhstan was the second exporter of goods to Iran among the Caspian states and 35th exporter to Iran among all countries. Trade with Russia (at $1.38 billion) and Azerbaijan ($389.33 million) saw the highest YOY growths of 57.57% and 29.66%, while trade with Turkmenistan ($374.38) and Kazakhstan ($200.05 million) witnessed the lowest declines of 6.06% and 0.15% respectively. Iran’s exports to Azerbaijan (at $370.7 million) and Russia ($246.45 million) saw the highest growths of 33.34% and 5.98% respectively, while exports to Kazakhstan ($120.82) and Turkmenistan ($366.3 million) witnessed biggest declines of 18.04% and 5.31% respectively. This is while imports from Russia (at $1.13 billion) and Kazakhstan ($79.23 million) witnessed the highest growths of 76.12% and 49.67% respectively, whereas imports from Turkmenistan ($8.08 million) and Azerbaijan ($18.63 million) saw declines of 30.87% and 16.35% respectively.